An opal engagement ring is a great way to have something unique and affordable to represent your love. The opal has a long history that is as unique as the gemstone itself. Opals have the ability to reflect all of the different colors of the spectrum, but there are two main kinds of opal, the black opal and the white opal. Each opal is unique and will reflect a number of different hues, so some opals look pink, blue, green, orange, or any other color. 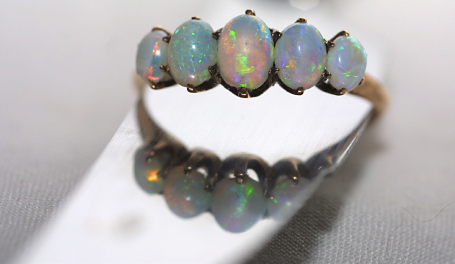 Historically, the opal was said to bring bad luck. People throughout history, and especially the Middle Ages, said that the opal resembled the “evil eye.” It was believed this stone was used by witches and sorcerers to do evil and terrible things. Opals also got a bad reputation during the Black Plague and in the early 1800s because of a book Sir Walter Scott wrote. In this book, Scott said that opals were used by those who practiced black magic. The opal hasn’t always just had a bad reputation. The Romans believed it was a lucky stone and that it spread love to whomever it was given to. There is an ancient folktale that says opals fell from the sky every time lightning struck. Greeks thought that opals could give their owners a psychic awareness. The reviews have been mixed as far as opals go. While some believed it resembled the “evil eye,” others thought it protected owners from evil and actually improved their eyesight. Diamond traders used to perpetuate the negative connotations associated with opals, because they were afraid that opals would be more popular than diamonds for jewelry. Now, opals are a unique and beautiful replacement for those who aren’t interested in the typical diamond rings. You can purchase opal engagement rings from a number of different places. You can begin your search online to ensure that you find the lowest prices available. Opal rings generally run anywhere from $200 to over $700 for the high end kinds. This is much cheaper than the cost of diamond engagement rings which usually run from $500 up to over $2,000. Lab-created gems are an eco-friendly choice for those interested, and lab created opals cost less than those from nature. Opal engagement rings can come in a number of different cuts, just like diamond engagement rings. They can be oval, circle, marquise, emerald, and even princess cuts. You can even purchase bands that have both diamonds and opals for a really unique and beautiful look. Opal rings can be customized, or you can purchase pre-set rings from any popular jeweler, such as Zales. You should make sure that if you purchase the opal engagement ring online that you are buying it from a legitimate business. If you’re going to buy an alternative to the standard diamond engagement ring, you’ll need to make sure that your girlfriend is a fan of opals. You need to make sure that she will accept this as an alternative for a diamond ring. You might want to find an opal that is high end and customized to make sure she’ll really love it. Try to find an opal that reflects her favorite colors. The opal is the official gemstone of Australia, because most opals come from rocks in Australia. You might want to buy an opal that is from Australia, or you might want to purchase an opal created in a lab. The opal is also the birthstone of the month of October. If your girlfriend’s birthday is in October, you might consider an opal engagement ring. The opal is said to inspire those who wear it, and it is a sign of love and purity. The black opal is said to protect those who wear it from bad dreams. If you do plan on getting an opal engagement ring, you’ll want to make sure your girlfriend knows the proper way to take care of it, because opals are a softer stone than diamonds, so they need a specific kind of setting and care. If your girlfriend will appreciate the unique beauty of this famous and infamous gemstone, you’ll win her over with the perfect opal engagement ring.